A host of proposed new laws designed to prepare the UK for a "smooth and orderly" departure from the EU have been announced in the Queen's Speech. Of 27 bills, eight relate to Brexit and its implications for key industries. As well as a bill to convert EU rules into UK law, there are measures on trade, immigration, fisheries, nuclear safety, agriculture and sanctions. But other key manifesto plans have either been axed or delayed after the Conservatives lost their majority. Proposals to axe the winter fuel allowance for well-off pensioners, scrap the triple lock on pensions, expand grammar schools and end free school lunches for infants have been dropped while other proposals, such as a cap on energy bills and reforms to social care funding, will be put out to consultation. Amid continuing talks with the Democratic Unionists about them supporting Theresa May's government, a Downing Street spokesman said it was confident the Queen's Speech could "command the confidence" of the House of Commons in a vote next week. There was no mention of US President Donald Trump's proposed state visit to the UK later this year, appearing to confirm suggestions it has been delayed. Ministers said the reason it was not included was purely because no date had been set. 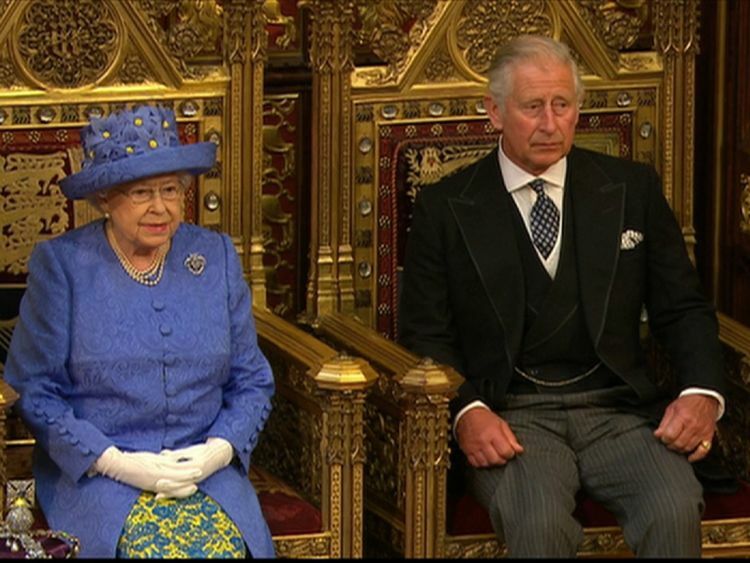 The Queen announced the government's legislative programme for the next two years at the State Opening of Parliament.